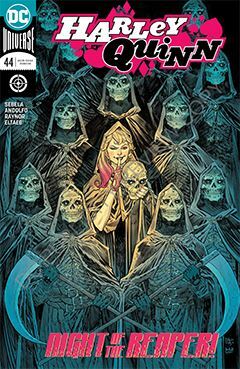 Harley is trapped in the tunnels under the city, and her best hope for getting out is one of Pyg’s dolls and a robe-wearing, scythe-wielding cult member. But those are the kind of odds are little anti-hero likes. In no time at all she has a plan to free both her and her new friends. I enjoy Mirka Andolfo’s artwork; a worthy addition to the repertoire of artists in her corner. It’s consistent with the book overall, yet Mirka brings something of their own to it as well. This is the end of the current story arc, so look for a brand new adventure next issue. It’s always a treat to see what kind of mad-cap hijinks our favorite crazy gal has in store for us.